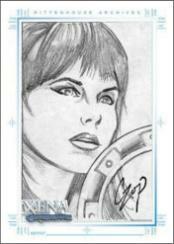 Rittenhouse Archives is pleased to announce that Art and Images of Xena: Warrior Princess Trading Cards will feature the most dynamic collection of Xena art ever to appear on trading cards. Renee O’Connor, who starred as Gabrielle throughout the show’s six-season run, headlines the roster of artists contributing to this amazing collection. Every box of the cards will include one of the 10 cards O’Connor created exclusively for Rittenhouse. The series will be release in October 2004. "It’s a thrill and an unqualified pleasure to have someone as important as Renee O’Connor working with us on this project," said Rittenhouse President Steve Charendoff. "Renee has really embraced this project, and we know how much this means to her fans. To the best of my knowledge, no other major star of any TV show has ever contributed so much to the success of a trading card set." Every box will also contain one genuine, hand-drawn sketch card depicting one or more key characters from Xena: Warrior Princess. Artists for this original sketch card series include Warren Martineck, John Czop, Cris Bolson, Sean Pence, Emir Ribeiro, Patrick Hamill, Eduardo Pansica, Joe Corroney, Scott Rosema, Steven Miller, Patricia Parker and Pablo Raimondi. Fans can expect to find their sketches of their favorite characters including Xena, Gabrielle, Joxer, Argo, Ares, Callisto, Aphrodite, Hercules, Borias and others highly detailed in pencil, ink and color! Continuing the artistic theme of this series, collectors will find bonus sets with art by Patricia Parker, Rebekah Lynn and Douglas Shuler. Also randomly inserted into boxes of the Art and Images of Xena: Warrior Princess Trading Cards are six new Xena Gallery cards and five unique Women and Warriors cards which are printed on plastic and individually numbered to 500. 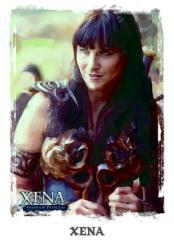 Each box of Art and Images of Xena: Warrior Princess Trading Cards will contain 20 packs with a suggested retail price of $4.20 per pack and $84.00 per box. Fans and collectors will also be able to store their collections in a custom designed collector's album, which will retail for $39.99, and contain an exclusive autograph card from Alison Wall as Minya and an exclusive Xena and Gabrielle promo card. Rittenhouse Archives, Ltd. is a leading producer of science fiction and fantasy based trading cards and related collectables. Its licenses include Star Trek, James Bond, Xena: Warrior Princess, Stargate SG-1, Stargate Atlantis, Farscape, Twilight Zone, The Six Million Dollar Man, Battlestar Galactica, The Outer Limits, Lost In Space and Conan.